After 9/11, handprint flags became ubiquitous. I later managed to have it donated to the Hoboken Historical Museum, since I felt it wasn’t being treated with the dignity it deserved. That inspiration from Georgia led me to create the first public Hoboken 9/11 memorial. I proposed the idea to Superintendant Patrick Gagliardi, and he thought it was a great idea and supported it. 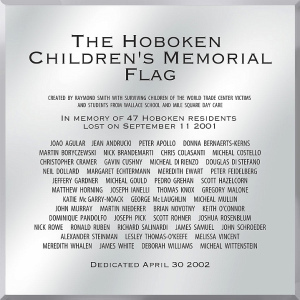 The memorial can be seen at the Hoboken Board of Education, where it has pride of place on the wall behind the Board members during their meetings. 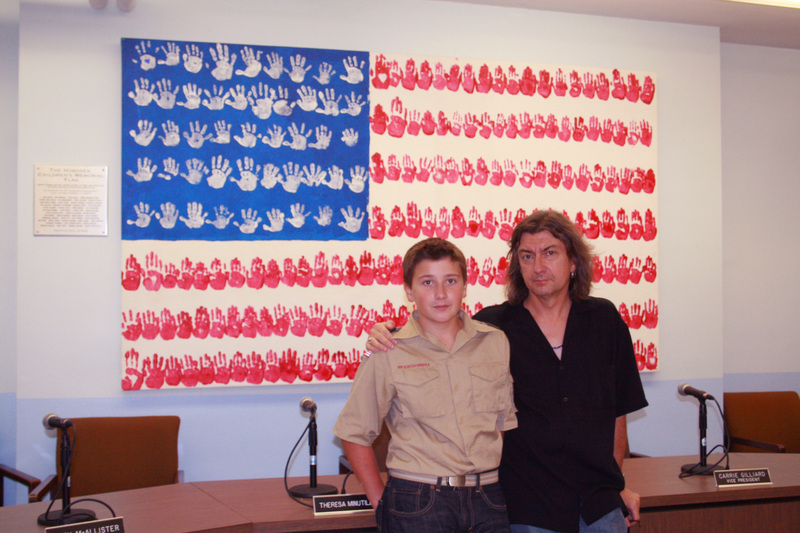 I began with collecting handprints for the red stripes at Wallace school on Jan 29, 2002. There were 10 classrooms, K-5, who signed up. On March 4, the canvas moved on to receive the handprints of the victims children at All-Saints Church, which is where the Hoboken 9/11 support group met on Monday nights. The remaining stars were completed with Mile Square Day Care children on March 7, and I completed the artwork on March 8, 2002. There are 229 handprints, 8 of which are the children of the Hoboken victims. My wife Mary, my daughter Valerie, and my son Charlie are the handprints that have a heart in their palm. It was dedicated at the Hoboken Board of Ed on the evening of April 30, 2002 with a presentation by Sandy O’Connor and myself. Sandy’s written presentation had the audience in tears. 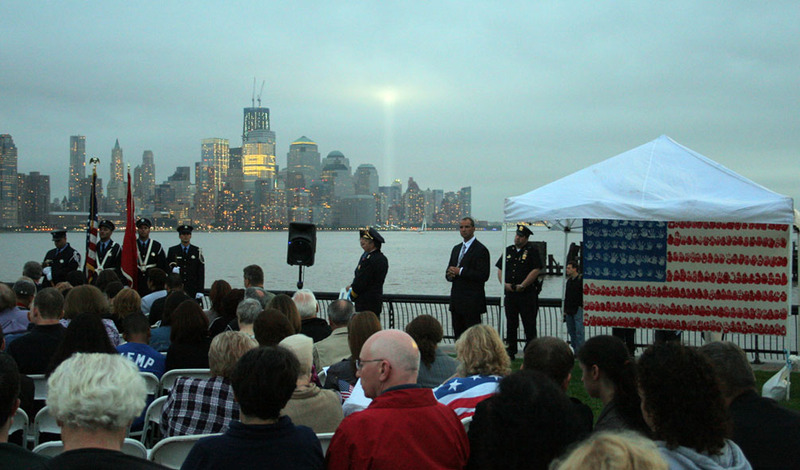 Each star represents one of 47 residents from Hoboken. They are listed in alphabetical order, and the victims children’s prints are matched with the name of their lost parent or loved one. My definition of ‘from Hoboken’ meant that they were either born here or officially lived here at the time of the event. I was very fortunate that all those who suffered a loss that day were willing to be a part of my project.I sought out each family on my list and one way or another I was able to include them in the project. I were in the same situation, I’m not sure if I would be willing at all. I also created a handprint flag that represented people from Hoboken and sent that on to Rome, Georgia as a thank you. It included politicians, police, firemen, children, homeless people from my art class, 9/11 family members, clergy and my family. 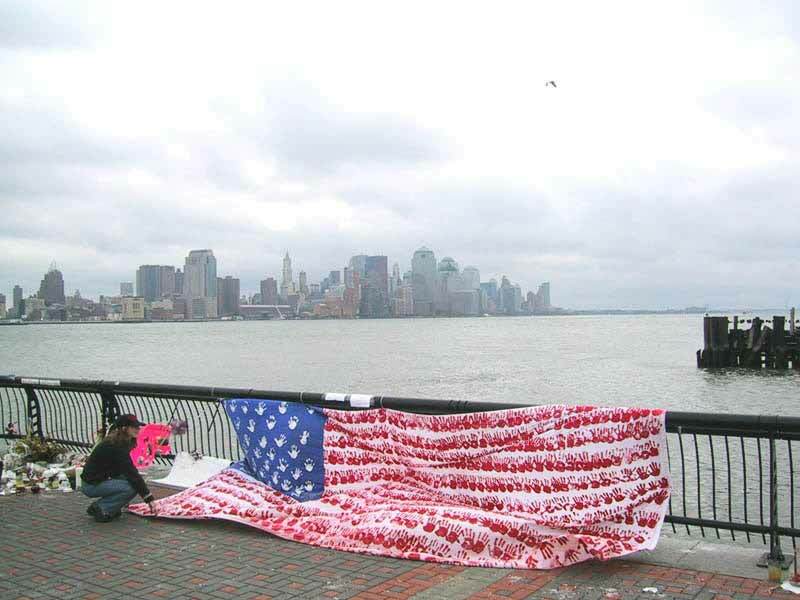 On the tenth anniversary, the flag was included in the city’s memorial ceremony on Pier A, and I made a full-size digital print for Hoboken High School. 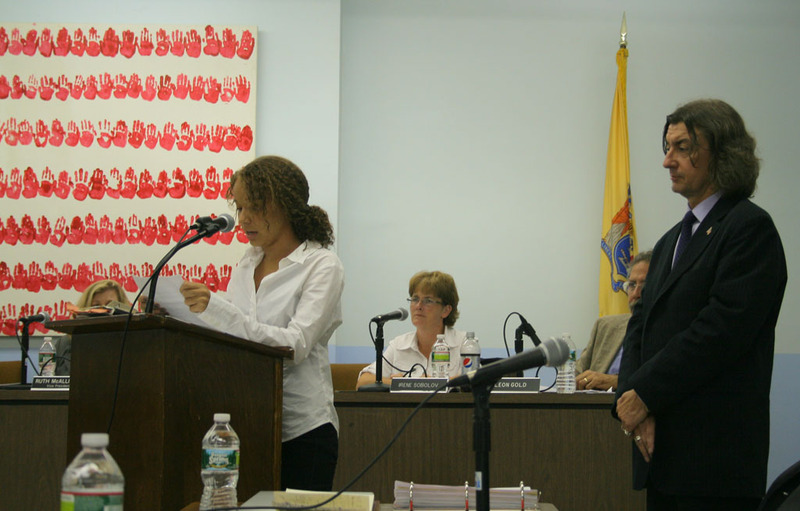 Imani Soler, one of the kids who made a handprint so long ago, helped me re-dedicate the flag at theBoard of Ed, by reading Sandy’s writing from the first dedication. I thought it was great that she was part of it, she represented well the time that had passed, and our hope for the future. This isn’t the sort of art that I usually make, but it’s become one of the things I am most proud of. Hoboken’s first 9/11 memorial is a tribute to all who were lost, their loved ones and their town. You’re amazing, thank you!